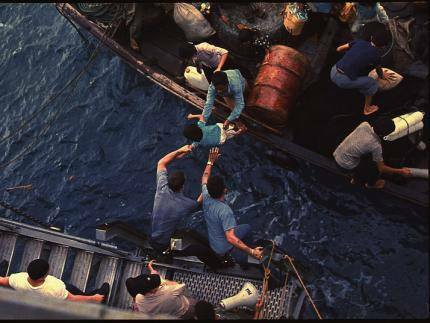 We undertook a desperate journey by sea to escape from Vietnam in 1975, when the South was “liberated” by Hanoi at the end of the Vietnam War, more than one million people had risked their lives in ramshackle crafts to escape repression. A lot of our Vietnamese brothers and sisters had died—drowned, eaten by sharks, or murdered by pirates in the Gulf of Thailand. We did it because we strongly believe in freedom of expression as a universal human right. For Vietnamese journalists, like my father, Nguyen Dam Phong and Le Triet, all they wanted was to be able to do their jobs, so that our beloved communities can benefits. Instead, they were systematic hunted by the Mat Tran Hoang Co Minh a.k.a Viet Tan. For the thirty-three years, they have enjoyed the impunity. They were never questioned and never paid for their crimes. I’m here simply because I was young (19 years old), naive and stupid and thus was no threat to them at the time. But will I be lucky, because the gunmen who have killed so many of my dad’s colleagues have not yet found me. Or will I be a “dead man walking” as they called my dad before pumping seven bullets into him. I remembered they told him “It’s not a matter of if, but when.” My dad dedicated his life to journalism. He believed an attack on a journalist was a proxy for an attack on the people and their right to information. He paid the price. My family paid the price. My dad died protecting the truth, protecting the integrity of journalism and building a foundation for future courageous Vietnamese journalists. The film “Terror in Little Saigon” was about an American journalist who sees my dad and his colleagues as his (as he refers to them as “my colleagues” in the film). For two years, he courageously did what the Vietnamese journalism had failed to do – seeking justice, so that his “colleagues” did not die in vain. I just wonder if the Vietnamese journalists are a little too comfortable here. Should you not be fighting more ferociously on behalf of your fallen colleagues? Do we not have an A.C. Thompson in our community? We cannot, and we will not let these Vietnamese-American journalists, as Dam Phong Nguyen die in vain. Silence no more!! !